The greatest of the late medieval Scottish makars, Robert Henryson wrote in Lowland Scots, a distinctive northern version of English. He was profoundly influenced by Chaucer's vision of the frailty and pathos of human life. His greatest poem, and one of the rhetorical masterpieces of the literature of these islands, is the narrative Testament of Cresseid, set in the aftermath of the Trojan War, which completes the story of Chaucer's Troilus and Criseyde, offering a grim and tragic account of its faithless heroine's rejection by her lover Diomede, and her decline into prostitution and leprosy. 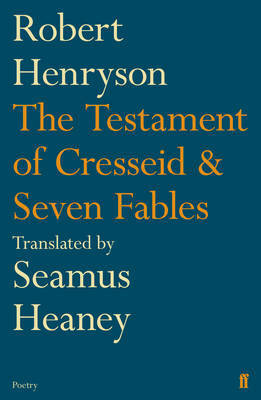 A work of unreconciled Shakespearean intensity, the Testament has been translated by Seamus Heaney into a confident and yet faithful modern English idiom which honours the poem's unique blend of detachment and compassion. 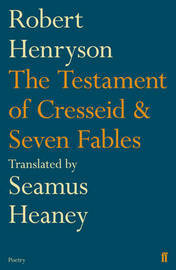 A master of narrative, Henryson was also a comic master of the verse fable; his burlesques of human weakness in the guise of animal wisdom are traced with delicate comedy and irony. Seven of the Fables are here sparklingly translated; their burlesque freshness rendered to the last claw and feather. Seven Fables and The Testament of Cresseid is an extraordinarily rich and wide-ranging encounter between two poets across six centuries. Seamus Heaney was born in County Derry in Northern Ireland. Death of a Naturalist, his first collection, appeared in 1966, and since then he has twice won the Whitbread Book of the Year. District and Circle, was published in 2006 and was awarded the T. S. Eliot Prize. In 1995 he was awarded the Nobel Prize for Literature.